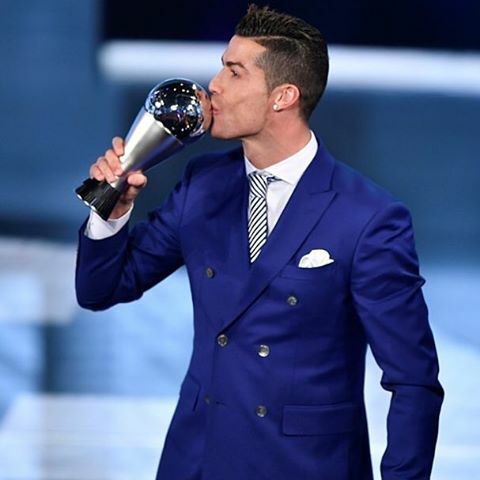 Cristiano Ronaldo; the first to win FIFA's new Best Men's Player of The Year Award. Cristiano Ronaldo on Monday night sets another record as he becomes the first player to win FIFA's new "Best Men's Player of The Year 2016" Award, the first of its kind... congratulations. He defeated Barcelona/Argentina best player- Lionel Messi and France/Atletico Madrid striker- Antoine Griezmann to be crowned the 2016 FIFA Best Player of the year... it was noticed that Lionel Messi was absent at the event.